Discussion of the House Republican budget has focused mostly on the privatization of Medicare, the block-granting of Medicaid, and the repeal of the Affordable Care Act. And that’s appropriate, given the magnitude of the changes and widespread impact they would have. But those proposals are obscuring some other proposed shifts that, in any other context, would be plenty troubling for their own sake. This week I'll highlight five of them. On Monday, I talked about radical changes to the Supplemental Nutritional Assistance Program (SNAP). On Tuesday, I talked about raising the eligibility for Medicare. Today I look at the weakening of financial reform. For the most part, we can measure the impact of the House Republican budget by thinking about the dollars not spent--i.e., the hundreds of billions of dollars that Paul Ryan and his allies would take away from Medicare, food stamps, and other vital programs. But some of the budget’s provisions have less to do with spending levels and more to do with regulatory authority. The most obvious and important of these is a proposal to eliminate a key feature of the Dodd-Frank financial reform bill and, in the process, weaken the government’s ability to prevent another financial crisis. 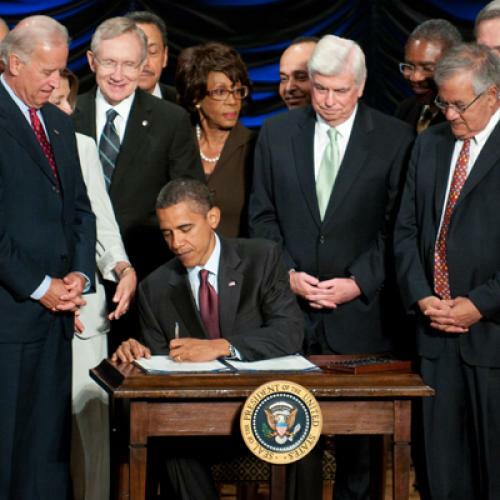 The Dodd-Frank law gives the government authority to subject certain large, complex financial institutions to additional regulation, on the theory that their collapse could have such profound effects on the rest of the econmy. In addition, the Dodd-Frank law puts in place a legal process that would allow the Federal Deposit Insurance Corporation, or FDIC, to place failing financial firms into receivership and put them through an orderly break-up when normal bankruptcy procedures won’t work. It’s the same sort of authority FDIC has long held for taking over and then dissolving failing banks. The phrases seemed to be lifted straight from a Frank Luntz public opinion memo and, like so many Luntz slogans, represented more or less the opposite of the truth. A major difficulty during the financial crisis was the government’s inability to manage the dissolution of large financial firms in an orderly way. When the big investment houses were on the verge of collapse, the feds really had just two choices: Take over the firms altogether, putting taxpayer dollars on the line, or let them go under. Lehman Brothers got the latter treatment and, well, we all know how that story turned out. Credit markets froze, the economy came to a standstill, and lawmakers decided they couldn't afford to let another big firm collapse. You needn’t take my word for this. Earlier this week, the FDIC released a report on how it might have handled the Lehman crisis if, at the time, it’d possessed the sort of authority the Dodd-Frank law now gives it. The report predicted that FDIC could have managed the sale of Lehman to another firm, Barclays, and obtained a better deal for both taxpayers and investors. "While there remains no doubt that the orderly liquidation of Lehman would have been incredibly complex and difficult," FDIC said, "it would have been vastly superior for creditors and systemic stability in all respects." FDIC Chairman Sheila Blair was a staunch, vocal advocate for giving her agency these new powers, so perhaps you'd expect FDIC to say such things. But Blair is no radical. As the Roosevelt Institute's Mike Konczal notes, she used to be counsel to Bob Dole, the former senator and Republican presidential nominee. Nor is Blair's view an isolated one. Henry Paulson, who was Bush's Secretary of the Treasury during the Lehman crisis, told Aaron Ross Sorkin of the New York Times that "We would have loved to have something like this for Lehman Brothers. There’s no doubt about it." To be clear, even supporters of Dodd-Frank concede this new resolution authority probably wouldn't work on the very biggest institutions, like Citibank or J.P. Morgan. In those instances, the government would face the same, unappealing choice between collapse and bailout. That's one reason my (much better informed) colleague Noam Scheiber, among others, argued so strenuously for even stronger regulation. But Dodd-Frank is at least a step in the right direction. Take it away, as the Republican budget would, and costly bailouts become more likely, not less. In that sense, I guess, this really is about government spending after all. For more on this subject, see Pat Garofalo and David Min, as well as Konczal and, of course, Noam. All of them have followed, and written on, this issue far more closely than I have.